I have heard of all sorts of “-ades” before but this one had me excited. 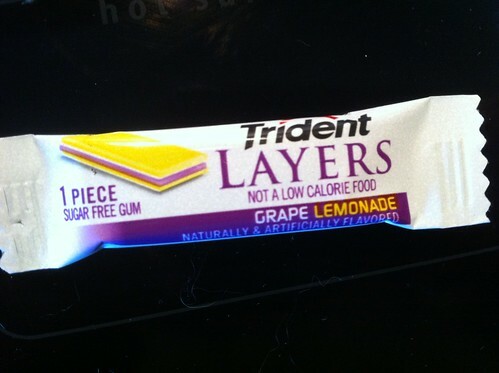 It’s a three-thin-layered- piece of gum that has a nice lemonade and grape flavor to it. When chewed – it blends. I really liked this. It’s on my list to look for at the store…after having just this sample piece. It’s going in the permanent gum rotation for certain. AND…. it makes me wanna take some real lemonade and see if I can “grape” it up… to the lab!